Native Range: St. Lawrence and Great Lakes, Hudson Bay, Mississippi River, and Gulf Slope drainages west of the Appalachian Mountains from southern Quebec west to western Ontario and Minnesota, and south to the Florida panhandle and southern Texas; on the Gulf Slope from the Choctawhatchee River, Florida, to the Rio Grande, Texas and New Mexico. Also in northeastern Mexico (Page and Burr 1991). Table 1. States with nonindigenous occurrences, the earliest and latest observations in each state, and the tally and names of HUCs with observations†. Names and dates are hyperlinked to their relevant specimen records. The list of references for all nonindigenous occurrences of Lepomis megalotis are found here. Means of Introduction: Accidental stocking as a result of stock contamination with other centrarchids. The record from Missouri refers to a 1985 collection that was the first in Missouri from any Mississippi River tributary above the junction of the Mississippi and Missouri rivers. The longear's presence here may be due to an undocumented introduction (Pflieger 1997). Status: Established in all locations except the New drainage of Virginia, where it may be extirpated, and Massachusetts, where there are no recent records (Cardoza et al. 1993). Remarks: Some ichthyologists believe L. megalotis may actually be native to the Tennessee drainage in North Carolina. Populations there may be at low levels due to extirpation by introduced L. auritus (i.e., Starnes and Jenkins, personal communication). On the other hand, Gilbert (personal communication) points out that there are many specie native to the Tennnessee River drainage of Tennessee that do not enter North Carolina and whose ranges stop abruptly at the state line (which marks the western limits of the Blue Ridge plateau), such as Luxilus chrysocephalus, Etheostoma duryi, Etheostoma camurum, etc. Gilbert states that the state line is characterized by sharp increases in stream gradient of the various tributaries which is most pronounced in the Watauga system and least pronounced in the French Broad River. It is probably not coincidental that several other species otherwise found in North Carolina, range (or once ranged) into that state only in the French Broad system - e.g., Hiodon tergisus, Percina caprodes, Etheostoma simoterum, Noturus eleutherus, etc. Further evidence for introduction is that although found in flowing streams, L. megalotis is not partial to the fast-flowing mountain streams characteristic of the Blue Ridge plateau. Stauffer et al. (1995) consider this species native, but possibly introduced to the Potomac drainage. Jenkins and Burkhead (1994) believe it is introduced and reported that the first record from the Potomac drainage in West Virginia was in 1953. The native status of Longear Sunfish in Minnesota is unclear. Eddy and Underhill (1974) mentioned records from Pomme de Terre River and Big Stone Lake from 1897 but question their validity. They state that many Longear Sunfish are misidentified. They accepted only a single record for the state, the one at Little Rock Lake. They also noted a population at International Falls, Ontario. Phillips et al. (1982) wrote that only two fish had been collected in the state, one at Little Rock Lake and the other at Hustler Lake, and that these may have been a result of introductions. However, Lee et al. (1980 et seq.) mapped six collection localities in the state. This may be an indication that this species is more widespread and possibly native to Minnesota and earlier authors overlooked these records; or as Eddy and Underhill suggest, they may be based on misidentifications. If the latter is true, then this species is very rare in Minnesota and it's presence there maybe the result of either introductions or isolated relict populations. Collections made in southeastern New York depicted in Lee et al. (1980 et seq.) were probably based on specimens identified by C. L. Smith. 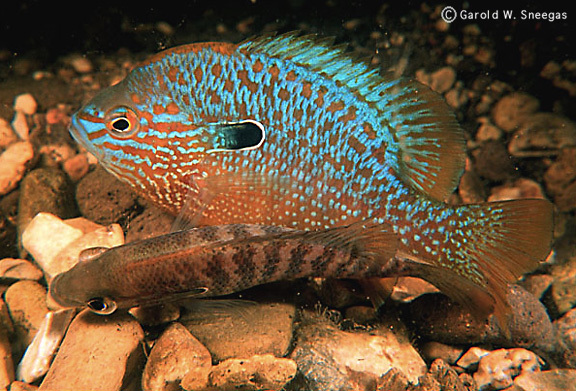 Smith later re-identified these fish as hybrids between the pumpkinseed and redbreast sunfish (Smith 1985). Burr, B.M. and L.M. Page. 1986 . Zoogeography of the fishes of the Lower Ohio-Upper Mississippi basin. In C.H. Hocutt and E.O. Wiley, eds. The Zoogeography of North American Freshwater Fishes. :287-324. Cardoza, J.E., G.S. Jones, T.W. French, and D.B. Halliwell. 1993. Exotic and Translocated Vertebrates of Massachusetts. Fauna of Mass. Series, Publ. #17223-110-200-11/93-C.R. 6:95 pp. Hartel, K.E., D.B. Halliwell, and A.E. Launer. 2002. Inland Fishes of Massachusetts. 328 pp. Red River Authority of Texas. 2001. Red and Canadian Basins Fish Inventory: Grayson County. Red River Authority of Texas. Red River Authority of Texas. Schmidt, R. E. 1986. Zoogeography of the Northern Appalachians. In C.H. Hocutt and E.O. Wiley, eds. The Zoogeography of North American Freshwater Fishes. pp. 137-160. Stauffer, J.R., Jr., J.M. Boltz, and L.R. White. 1995. The fishes of West Virginia. West Virginia Department of Natural Resources.